I thought I’d share my most recent post hip-replacement endeavors. Over the last two years my activity level has increased exponentially. I’ve lost 20+ pounds, I’m able to wade my favorite fishing waters, climb in and out of my boat painlessly, and hike the backwoods like a teen-ager (sort of); all things that were impossible before surgery. As a current active duty firefighter the job can at times be quite arduous, and the older I get the more I have to focus on maintaining myself “Fit for Duty”. Recently a great friend was diagnosed with AML Leukemia. His son is a firefighter and I learned he was going to participate in the Seattle Firefighter Stairclimb in his dad’s honor. The event is a benefit for the Leukemia and Lymphoma Society. Having participated in this event more than 15 years ago, I knew what I was up against, and immediately pledged to climb (yes, I’m crazy)… showing my support while giving me the motivation to train for the event. 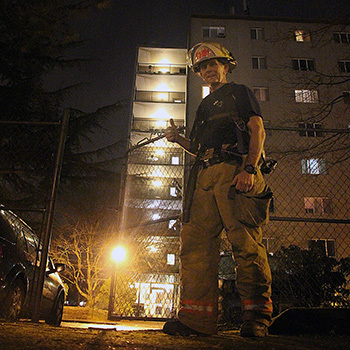 The firefighter stairclimb occurs on March 6th, at the Columbia Center in downtown Seattle. It requires firefighters to wear full combat gear complete with breathing apparatus and climb 69 flights of stairs. That’s 1,311 steps with a vertical elevation gain of 788 feet. I have set my goal at sub 20 minutes, which will be a huge accomplishment for my age group. To prepare for the climb I started training in December. My regime includes countless hours on the stairmaster while climbing local high-rise stairwells, including Portland’s “Big Pink” tower. I also add in a healthy dose of CrossFit and interval training, with lots of focused leg exercises including squats, lunges, box jumps, burpees, mountain climbers, and even dead lifts. I am happy to share that my hip is holding up perfectly, and just like you predicted, the only time I’m reminded of my hip replacement is seeing the scar. I guess next time I’ll ask for a plastic surgeon.